No reason. 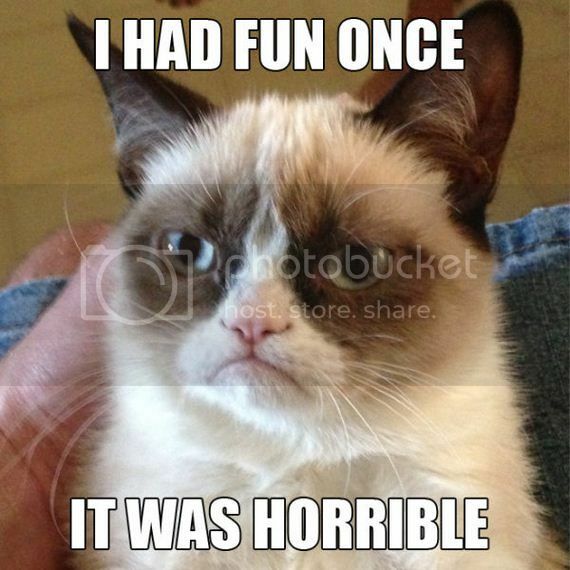 I just like Grumpy Cat. I tried a 330 wpm just now, and while I got it in places and did NOT drop, it was mostly pretty messy. And that's quite a bit slower than 370. Doesn't look good for me at first blush. But it's been five months since the NCRA speed contest where I got 280 wpm, and now I'm possibly around 320 (allowing for the messiness of that last 330). That's an increase of 40 wpm. That means if I maintain the progress, in five months--June--I should be at 360, and then that's within spitting distance, right??? *I've run into several Muggles--non-steno folk--who have expressed amazement when I mention that I have to excuse myself to practice, or that I train every day. "You mean you PRACTICE??" Pete's sake, it's the WORLD RECORD. Just because you've taken a few violin lessons doesn't mean you can immediately rip into the Devil Went Down to Georgia. Devil Went Down to Georgia? You crack me up! Thank you for your weekly inspiration!